Today was the fourth day of the Holiday Running Streak, and the Run-a-Latke 5k! 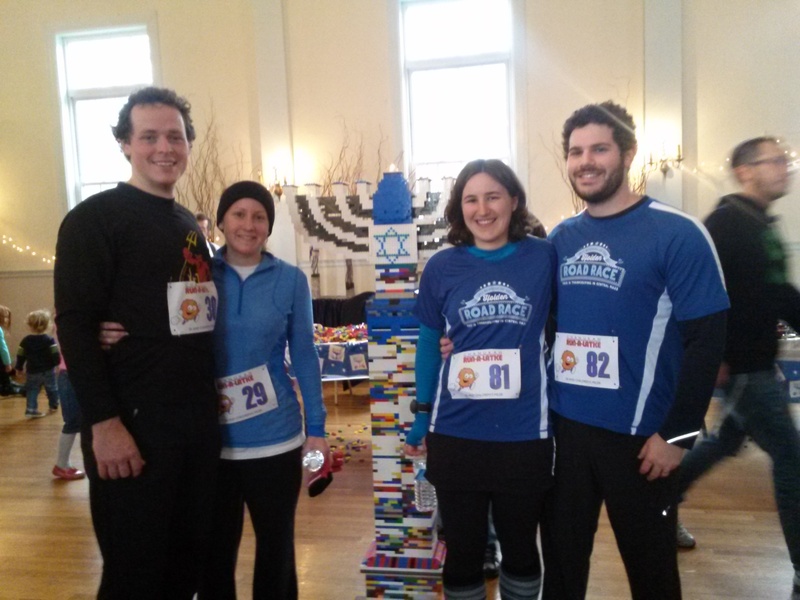 I love holiday races, and I was super excited to find a Hanukah race to add to the calendar. Jeff and I ran it with his sister and her husband…our second 5k w/ them in 4 days time. It was a pretty small race; so small that we were all able to place in our age groups! We took 1st and 2nd in the women’s 20-29 age group (out of 2 total) and 2nd and 3rd in the men’s 20-29 age group (out of 3 total). Impressive, right? hahaha. Actually, I’m pretty psyched about getting an age group win; I thought I’d have to wait until at least 70 for that to happen. Lucky for me, 20 to 29 year olds were in short supply today. That said, I had a pretty fast race today (for me). Knowing that there was a chance to win an age group award, I wanted to push myself a bit. There wasn’t really a crowd at the start to weave in and out of, and we finished the first mile in 8:11. Knowing that this was much too fast for us (as a group), we slowed down to complete the second mile in 9:13. There were a few more hills in the second half of the race (or at least it seemed like it), but we were able to pick it up a bit for the last mile (8:58) and finish in 27:20! The after race “party” was pretty fun, too! 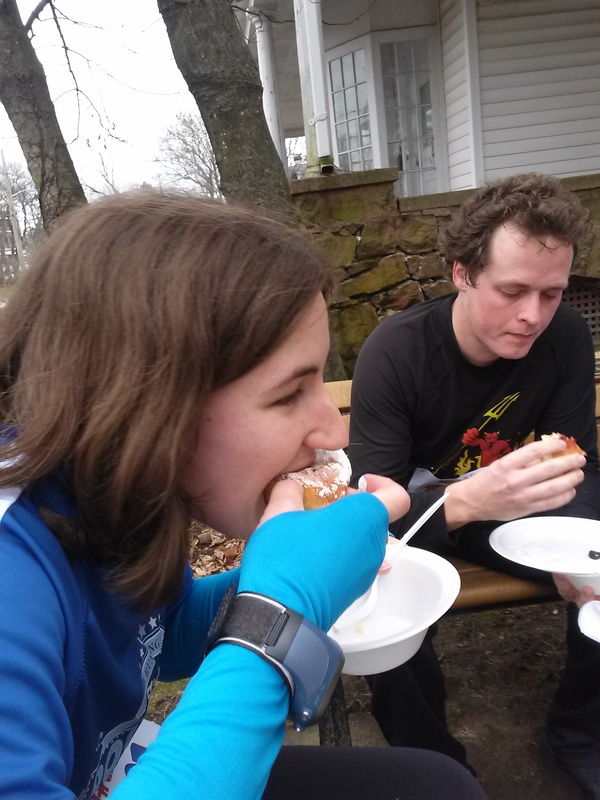 There were latkes, of course, and donuts… a delicious change from bruised bananas and rock hard bagels. We were planning to go out to eat after the race, but ended up not needing to after the great food. They also had a giant Lego Menorah (check it out in my picture) and a bouncy castle. All in all, I had a great time, and I look forward to running again next year. I think this was it for a while for the easy runs in the Holiday Streak. Tomorrow I head back to work, and this week is going to be busy. I have a deadline, and our office holiday party is on Thursday. I’m going get up early tomorrow (ugh…before 5:30am) and take full advantage of the 1 mile minimum, to get the run in before work. Here we gooooooooo!